Fourteen people attended the February meeting of the Central New Hampshire Linux User Group, a chapter of the Greater New Hampshire Linux User Group. We held our meeting at the usual place and time: the first Monday of the month at the New Hampshire Technical Institute Library, Room 146. Formal meeting starts at 7 PM. Gathering and networking often starts a half-hour earlier. A few of us met at Panera Bread in Concord before the meeting for dinner and geek talk. We’ll try to make this a regular thing, if people want to. Before the main meeting, maddog showed off a video he had created, inspired by some recent demonstrations of Open Source software he had seen. Using nothing buy Open Source software, including Inkscape and Kino. maddog emphasized that he’s not an experienced cinematographer, nor had he much experience with the other packages, but that making the video was simple and straight-forward. And the results quite amusing. Look forward to a future post with a link to the video! We were fortunate to have a variety of attendees to discuss the topic of “Open Source Business Models.” After a brief introduction of what the LUG was about and where to learn more, I opened the floor to the attendees for discussions, and discuss they did! We talked about the Brazilian music scene, Microsoft EULAs, the difference between Free Software and Open Source software, some great Open Source success stories, like the Project.Net software. There were questions on the fine points of licensing, comments on the openness of the Java Development Kit and runtimes, and much good discussion. in interactive ruby and counting off around the room (I started with zero and we went clockwise around the room, a surprisingly difficult process with cats). Mark and Bill each won a book, congratulations! The next CentraLUG meeting will be the 2nd of March. Stay tuned for an announcement of details. Thanks all for attending and vigorously participating. Thanks to Bill for bringing the projector, though we didn’t need it. Eight people attended our October meeting of the Central New Hampshire Linux User Group, held as usual on the first Monday of the month, at the New Hampshire Technical Institute‘s Library, Room 146, at 7 PM. We had the usual round of announcements. I had a ‘hot off the presses’ set of Apress Fall/Winter 2008 catalogs (3.3 Mb PDF) to pass around, including the half-page feature of the GNHLUG group as the highlighted user group. I mentioned the many discounts UG members can get through the various publishers, especially Apress, O’Reilly and Pearson. As usual, I plugged the gnhlug.org web site as the place to get the event calendar, and we reviewed some of the upcoming events, like the SwaNH infoeXchange and MonadLUG’s MySQL meeting tomorrow, the NEAR-Fest the following two days, and some of the interesting upcoming meetings. Keep an eye on the calendar and subscribe to the announcement list for future meetings. Arc Riley was the main presenter. A newcomer to New Hampshire, Arc was previously active in a FOSS group in Ithaca, NY, and is an active contributor to several Open Source projects, including PySoy (which he demoed a few months ago at PySIG). He’s also an active member of the New Hampshire Ubuntu Local Community organization (“Loco”), which is working its way to formal approval as a Loco with the Ubuntu organization. Activities such as the Software Freedom Day activism last month and presentations at the LUG count towards this recognition. Arc had a presentation on the upcoming version of Ubuntu, 8.10 (Year.Month) due out at the end of the month, code-named Intrepid Ibex. A list of new features can be seen on the web site and Arc reviewed them briefly (slides) and then demonstrated several of them, including: Gnome 2.2.4., X.org 7.4, Guest session, Network Manager 0.7, and more. We also got to break it a bit, perhaps, by testing to see if a USB device plugged in when the Guest user was active would be readable, and whether there would be any security implications to that. The USB subsystem seemed a bit unresponsive, and poking in the logs revealed that some of the other devices on the bus, like the webcam, weren’t natively recognized (Arc hadn’t added drivers yet) so it was possible the subsystem was unavailable. Did we mention it was a beta? Beta test reports are welcomed by the Ubuntu team, as they hope to release a final product at the end of the month. We got to talk a bit about Ubuntu and the community behind it, the philosophy surround the distribution, and the activities of the Loco, including pictures from SFD 2008, which included a Wookie, balloons, a penguin, Ben Scott and lots of geeks promoting Linux. Ben was heckled in absentia at the CentraLUG meeting. The next meeting of CentraLUG will be on Monday, November 3rd, the day before what may be the most important election of our time (vote early, vote often!) with a topic TBD, but at the same place and time. Stay tuned for announcements and updates! Thanks to Arc for presenting, to Bill for the projector, to Nikki for the transportation, to the New Hampshire Technical Institute Library for the facilities and to all for attending and participating! Nineteen people made May 5th’s CentraLUG meeting the second best attended of any LUG meeting so far this year, and the most populous CentraLUG meeting in over two years! The meeting starting with a rag-tag band of Linux enthusiasts wandering around the campus looking for a room to meet. It’s finals week at NHTI and we’d been bumped from our regular spot. From the Library to the Crocker building to the Little Building we moved as more and more and more attendees arrived and we outgrew our first and second choices of rooms. Thanks to all for patience and multiple moves, and apologies for any folks we lost along the way. The hassle was worthwhile, as Ben put on a great presentation on “The Linux Server That Could: Setting up a Small Office Server.” Over the years, both as part of his work and his hobbies, Ben has set up many multi-purpose computer servers: a single machine to serve a small workgroup with mail, files, printing, centralized DNS, DHCP. Ben had some slides to introduce the concepts and frame the problems his scripts solves, and then he dove into how to set up and configure the services. Providing a running commentary while he showed us configuration files, he offered a number of Best Practices tips for configuring, naming your intranet ‘domain,’ how CentOS/Red Hat family distros work, the differences in different flavors of Linux distros, editing configuration files, viewing error logs and more. It was a content-filled hour! Slides and sample scripts and configuration files can be found on the GNHLUG web site here. Thanks to Ben for a great presentation, to Bruce Dawson for last-minute projector duty, to Bill Sconce for helping with the raffle, to the NHTI staff for helping us find facilities, and to all who attended and participated! Eight people attended the April meeting of the Central New Hampshire Linux User Group, held as usual at the New Hampshire Technical Institute Library, Room 146, on the first Monday of the month (see below, we’re evicted until fall). Coleman Kane was the main presenter, showing us how the MinGW and GNU binutils packages could be used to create a cross-compiling environment to create Windows-compatible binaries on Linux (or actually, starting from BSD in Coleman’s case). He had a great slide deck and example source and was able to push through 55 slides in 75 minutes in a comprehensible fashion. The pace was fast and furious as he covered all of the highlights, took questions from the audience, edited and compiled code, and switched the projector between his BSD box and a Windows machine to show the code running. Whew! Well done and very informative! Thanks to Colman for his great presentation, to Bill Sconce for providing the nice projector, to the NHTI for providing the facilities, and to all who attended for their attention and participation. Twelve people attended the March meeting of the Monadnock Region Linux User Group, MonadLUG, held as usual on the second Thursday of the month at the SAU 1 offices on Hancock Road in Peterborough. Charlie called the meeting to order at 7 PM and we had the usual round of announcements. One member offered an HP LaserJet 4L and a new cartridge to anyone interested. There’s problems with the paper feeding, likely the rollers, and he didn’t have the inclination to fix it himself and went out and bought a new duplexing laser. If anyone’s interested, we can try to get you in touch with him. operator, a past profession we share) and is very interested in getting games working well under Linux. Wine Is Not an Emulator, but a API layer that provides the resources Windows executables need to run under Linux. The main page is at http://www.winehq.org and there’s a lot of information available there. Philip was running OpenSuse 10.x and demonstrated how easy it was to use the built-in YAST tool to locate, download and install a current and stable Wine release, version 0.9.42. Despite having practiced it several times, things don’t work the same during a presentation, and Philip was great about rolling with the punches and showing us how to configure, troubleshoot and tweak on Wine. We talked about the commercial alternatives, CrossOver Office from CodeWeavers and Cedega’s work with getting high-end games working, the Application Database at WineHQ where you can examine the list of programs known to work or known to have limitations and pick up suggestions on how to tune the application to your needs. Ken got a chance to show off the new facilities of the meeting room. A new hi-tech podium’s in place that supports two projector screens, one of which is a touch-screen, dry-erase screen. The project supports computer video, TV tuner, DVD, videotape and a color video camera that can scan and preserve on memory cards,a 21st century opaque projector. Beautiful equipment! It may take us a while to learn the magic X configuration to get it working, so be prepared for a little struggling at the beginning of the meetings. Next month, Guy Pardoe will demonstrate Joomla 1.5, the newly-released (and significantly re-engineered) content management system written in PHP. There’s a book on Joomla 1.5, written by Barrie North, who’s spoken at the Dartmouth – Lake Sunapee Linux User Group. It’s published by Prentice Hall PTR, an imprint of Pearson Education. Attendees to the recent CentraLUG meeting may recall we had a copy raffled away. Thanks to Philip for a great presentation, to Ken for providing the space and facilities, to Charlie Farinella for organizing, promoting and moderating the evening, and to all for attending and participating! Ten attendees made it to the October meeting of the Central NH Linux Group, coming from as far away as Nashua, Laconia, Peterborough and Hanover. CentraLUG is a chapter of the Greater New Hampshire Linux User Group, and our meeting was held as usual on the first Monday of the month at the New Hampshire Technical Institute‘s Library, Room 146, from 7 PM to 9 PM. Michael Kazin presented Nagios, the host and service monitoring system. Michael told us a bit of his colorful personal history, and his exposure to Nagios as a student administrator of the Rutgers University computer center. He had found a neat diagram of the relationships between the configuration files in Nagios (we covered the current 2.x and not the 3.x, currently in beta) and went to explain how it could be used for businesses and home users, keeping an eye on working systems, alerting the operating to problematic conditions of low disk space, high CPU usage or unavailability of resources or services. 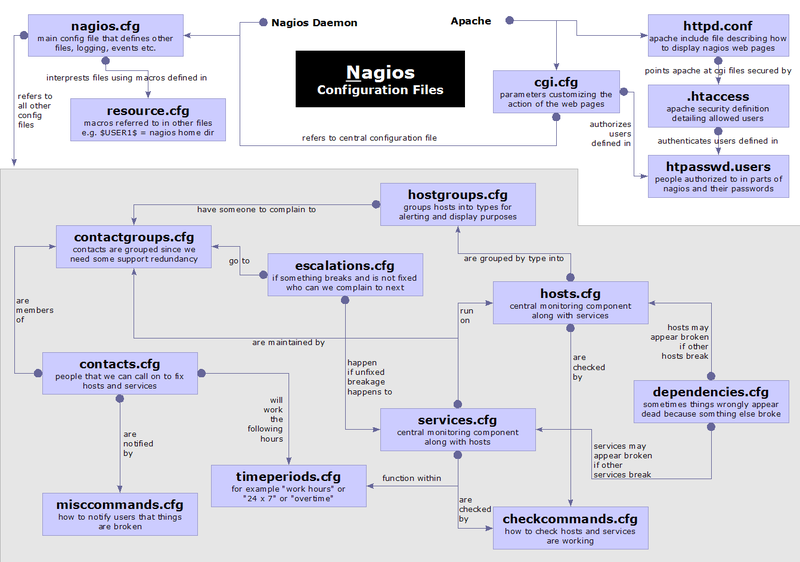 Nagios has a huge number of pre-built modules, a 240-page manual, and documentation on how to extend the system for your own use. Michael ended up with a presentation of a working Nagios installation on his home network, and showed how shutting down a service would set off an alarm, how the operator could flag the alarm as acknowledged, fix the problem, and verify that the alarm cleared. While the audience watched, participated and pestered Michael with questions, we identified and fixed a couple of permissions issues with his install and got the system to do things he’d never tried before. A good time was had by all. Wish you were there. Michael’s slides are available on the GNHLUG site. Bill Sconce was present to point out that modules could be written in Python. Ben Scott was heckled. I made the usual announcements: GNHLUG meetings can be found on http://www.gnhlug.org; several related meetings are taking place this month: SwANH’s annual infoeXchange, the NEARfest ham radio gathering. See the web site for links. Thanks to Michael for a fine presentation, to Bill Sconce for providing the projector, to NHTI for providing the space and to all for attending and participating. Suite 501, Concord, thanks to member (and Sybase employee) Larry Cook. Merrimack River. Immediately after the bridge, take the first right. left. At the end of the hallway is the conference room. Open to the public. Free admission. Tell your friends. Roger Trussell will present a session on building Firefox extensions. new feature. Extensions allow Firefox to stay small and unbloated. software installer technology and he has worked in end-user support roles. http://www.centralug.org and http://www.gnhlug.org as I learn them!